Photograph of the west gate at Sanchi, from the Archaeological Survey of India Collections by Deen Dayal in 1882. The Great Stupa of Sanchi is the most important surviving monument of the Shunga era. It consists of a large hemispherical dome which was built over an already existing stupa ascribed to the 3rd Century BC from the time of the Buddhist emperor Ashoka Maurya. Four elaborately carved gateways were added to the stupa during the 1st Century BC. When General Taylor encountered the stupa in 1818, the various parts of the southern and western gateway were lying on the ground and by 1883 were reconstructed. The Western Gateway consists of 2 square posts crowned with a group of 4 pot-bellied dwarfs which support a triple architrave with scrolled ends. 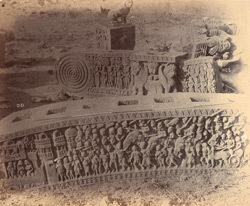 The photograph shows the sculptures on the rear of the middle architrave which depict the war over the Buddha's relics.